Find device-specific support and online tools for your Samsung Galaxy Book. 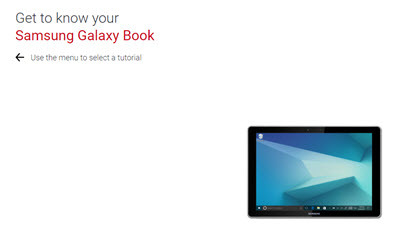 Learn how to activate and set up your Galaxy Book. The interactive simulator provides step-by-step instructions for how to use your device. Here's how to set up Cortana for your Windows 10 device. Here's how to install apps on your Windows 10 device. Here's how to update apps on your Windows 10 device. Here's how to open or close apps on your Windows 10 device. Here's how to view, open or close recently used apps on your Windows 10 device. Discover how to search for and download an app on your Samsung Galaxy Book. A visual walkthrough for uninstalling an app from your Samsung Galaxy Book. Learn how to find places around you in a chosen category using Google Maps on your Samsung Galaxy Book. Discover how to navigate to a location using Google Maps on your Samsung Galaxy Book. A visual guide for how to add layers to Google Maps to view current traffic on your Samsung Galaxy Book. Discover how to send a video message using your Samsung Galaxy Book. See how to forward a text message using your Samsung Galaxy Book. Learn how to reply to a text message on your Samsung Galaxy Book. Find out how to send a text message using your Samsung Galaxy Book. An interactive how-to guide for setting up text messaging on your Samsung Galaxy Book.